It's the best time of the year in the high country to chase a trout bite. Bear Canyon, Willow Springs and Woods Canyon in the White Mountains are being stocked with trout. The Little Colorado River in Greer, Show Low Creek and Silver Creek,see photo above also will be stocked. Also, the Tonto Creek Hatchery this week is stocking Tonto Creek, Haigler Creek, Christopher Creek, the East Verde River and Woods Canyon Lake. Woods Canyon Lake is receiving a particularly large load of trout. There also are plenty of bluegill in the lake and even some minnows. The water temperature at Woods Canyon Lake topped out earlier this week at 66 degrees. 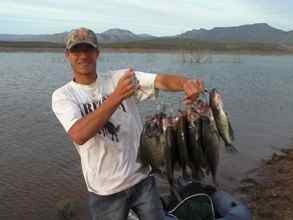 For fishery locations visit the Fish & Boat Arizona map. James Goughnour of Rim Country Custom Rods reported that trout fishing on the Mogollon Rim Lakes was called excellent again this past week. Lots of anglers reported good numbers of stocked and one year old trout being caught, he said. In his weekly report, Goughnour continued: "Power Baits, and salmon eggs were reported successful; small spinner baits such as a Roadrunner and Panther Martin were working well on an ultra-light rod. A small, crawfish-colored crankbait also had been working great. Fly anglers continued to have success using green, brown and black wooly bugger flies with some tinsel on them. Wind is a major factor on most of the rim lakes, so if you plan to go, expect the wind to pick up around midday, but it's hard to beat the early morning calm fishing conditions of our rim trout lakes." • Building, maintaining, attending, or using a fire, campfire, charcoal, coal, or wood stove including fires in developed campgrounds or improved sites is prohibited. Exemptions include persons using a device solely fueled by liquid petroleum or LPG fuels that can be turned on and off. Such devices can only be used in an area that is barren or cleared of all overhead and surrounding flammable materials within 3 feet of the device. • Smoking is prohibited unless it is within an enclosed vehicle or building. • Discharging a firearm except while engaged in a lawful hunt pursuant to state, federal, or tribal laws and regulations is prohibited. The exemption to this is that the discharging of firearms is allowed on agency designated shooting ranges. • The discharging or using of any kind of fireworks and incendiary devices is prohibited. • Any Federal, State, or local officer or member of an organized rescue or firefighting force in the performance of an official duty. • Industrial operations where specific operations and exemptions are identified and mitigation measures are implemented as outlined in an agency plan. • Operating generators with an approved spark arresting device within an enclosed vehicle or building or in an area that is barren or cleared of all overhead and surrounding flammable materials within three feet of the generator. • Operating motorized vehicles on designated roads so long as you park in an area devoid of vegetation within 10 feet of the roadway. Finally, a quick notice to Patagonia Lake boaters: Please be aware that only one boat launch ramp is currently available at Patagonia Lake. Hazardous, low water conditions at this ramp have forced Arizona State Parks to post the ramp as "Launch at your own risk."